Isn’t this the sweetest? I’m liking the marriage of Polychromos colored pencil and the Strathmore mixed media journal, which has a nice tooth. I’m finding it helpful at this point to focus on value, which is why I kept this one monochromatic. I’m really enjoying this challenge, and I hope that when I reach 100 faces, I’ll feel encouraged enough to ramp up my goal and keep on going! Happy Sunday! Peace and arty inspiration to you *flinging joy*! Your challenge is paying off! I love the sweetness and pose if this canine! I think the simplicity of tools and paper is just what is needed for this sketch. Happy day ahead. Thank you, Sharon! We can learn so much from animals. I’m really enjoying the challenge of fur. I’d love to take this challenge all the way through the year, and just see how many faces I can manage. Many of them are still hiding in sketchbooks, so I suppose I’d have to count them all hehe. I agree fur is fun and a challenge. 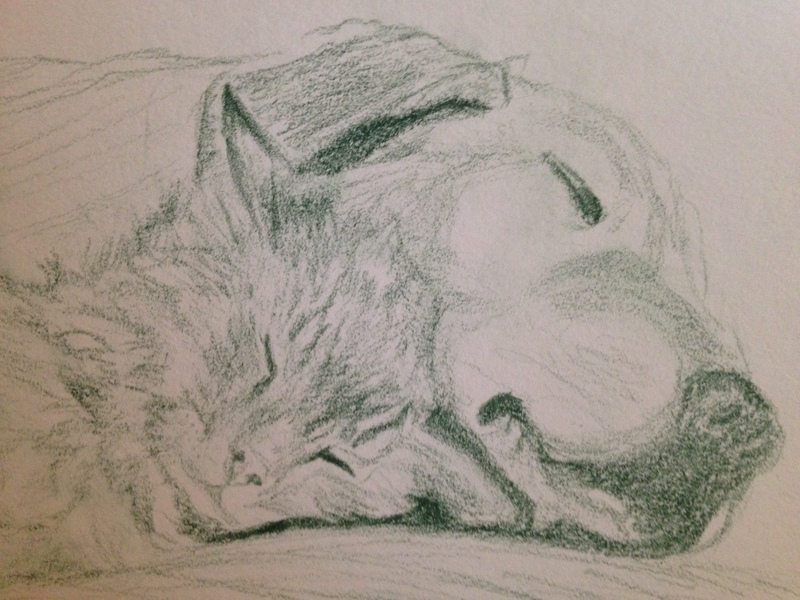 You do have lots of dog and cat breeds to draw! Thanks, Mrs Sunshine! I wish you ran the universe, Jodi! hehe! I would love to do hundreds of faces, just keep going all year and see where the road takes me. Would be fun to count up all of them, including many that never make it to the blogosphere. Boy WP would be a different place without you too! Have a great paint puddle-y Sunday! Thank you so much! Glad you enjoyed it. I can picture that scene with your dog and cats. So cute! Laura that is great. You are capturing so much. I like this notion of reducing to value. Thanks, Kirk! It’s something I need to really focus on to bring more depth and realism. Onward! Glad you like this one! Very nice! Your captured their relationship. Colored pencil is an interesting medium. It can adapt to any style. Thanks, Carmel! I just love those things, and with the MM paper, I find them hard to resist. The smell of graphite is pretty cool too though. Love the feel of both against that paper! Glad you enjoyed this! This is great – I also saw the dog first, and the cat as shadow…! Oh wow. That’s really good to know! They do blend together in the photo but I think doing more than one at once is definitely more of a challenge. Such a sweet sweet sketch. You totally captured the love. Aww thanks Teri!! I’m so glad you can feel it. I appreciate that. Thanks, Iris! I’m glad you enjoyed it. The book does look good! If I wind up really loving it, I’ll mention it again. Beautiful sketching and subject Laura. That is a great use of black on the dogs nose by the way. Thanks, Denis! The nose, I’m finding, is the hardest part of a dog’s face. I’m wondering if I might be able to try Charlie, but I probably would need a photo of her in really great light. If you are able to see all of her features clearly in the photo, feel free to post a link to it if it’s on your blog or email to createarteveryday@comcast.net. Black fur is so so challenging. I’m able to do ok with white, though, so there’s hope for black now (maybe). Thanks as always for your visits and comments. Thanks, Kerfe. I’m loving the faces. What a beautiful drawing – you captured the sweet scene beautifully. Thanks, Mary! Trying to get those forms down. I appreciate your encouragement, as always! Thanks so much, Debi! I’m really glad it translates because I’m definitely feeling it these days. I feel like I’ve got a road now, not drifting or trying to find the right subject anymore. Still wondering what medium I might settle into but maybe I don’t need to choose on that and just go with what feels right at the time. I really appreciate your input! Thank you! Thanks so much, Jill! They were so cute together, I couldn’t resist! Thanks so much, Donna! I’m so glad you’re seeing it in the artwork. The photo is beyond sweet! Soooo cute :-)! Reminds me of a long time ago when my friend’s female dog mothered a little kitten he adopted. It was really sweet to see them snuggle and nap together. The photo was amazing! Thanks, Jennifer! Ohh my God i don’t know how i missed this post! its super super super awesome! I just love cats and dogs as friends, I couldn’t resist it! So glad you enjoyed it!